Functionally furnished single bungalow on 420 sqm plot with covered terrace; Living area about 52 sqm. In the spring of 2008 newly built living room with fireplace, dining room, kitchen, two bedrooms. In March 2019, the interior was newly renovated (bedroom, dining room and kitchen repainted). The small bedroom now has two single beds next to each other (2x 90x200 mattresses) and a much larger window. The bungalow is ideal for 2-4 persons, especially families with children. New covered terrace. Very quiet location near the beach. 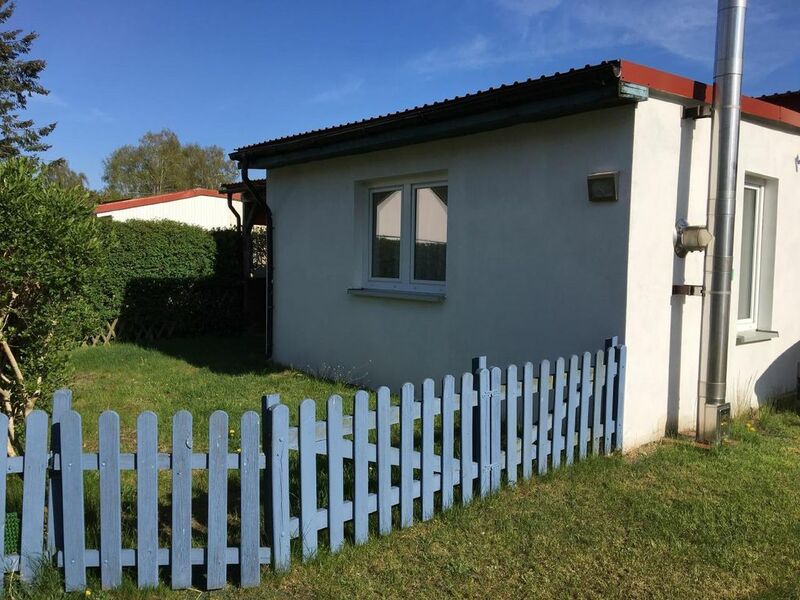 Very suitable for Holiday with dog, because the bungalow is completely fenced. The Szczecin Lagoon is a quiet Haffmeer, not particularly deep. The small beach is 300m from the bungalow, to the larger beach leads a path through the forest (trim path), it takes about 15 minutes. on foot. Pets (dogs) will be welcome. However, there is a cleaning fee of 10 € per pet / per week. In addition, we ask them not to let their pets sleep in the beds (consideration for all subsequent guests is required) and if necessary incurred "digging holes" of dogs to shovel again. - Pet: per object per week costs of 10 EUR (compulsory). - Bed linen: to rent per person per week for 10 EUR (optional). Linen (per person per week, according to consumption 10 EUR).